The Lake District National Park is an area of outstanding beauty and perfection of scale. It contains rugged fells, dales, lakes, tarns and wooded valleys which combine to create spectacular and tightly packed mountain scenery. Seen through the seasons the area offers an unending variety of interest especially for painters and photographers. After the critically acclaimed success of his book of walks, Discover the Lake District (Halsgrove), Jerry Rawson has now turned his attention to creating a collection of panoramic images of the area throughout all seasons. From the golden autumnal colours of the woods around DerwentWater, the rugged ice-carved combes of Helvellyn to the majestic Scafell range looking quite magnificent when reflected inWastWater and illuminated by the setting sun. He has captured brooding skies, storms sweeping across the fells and the low light of dawn and dusk illuminating the landscape in a golden glow. 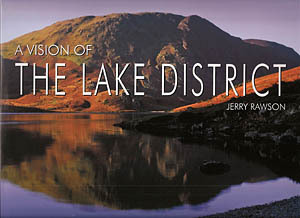 This beautifully-produced book, copiously illustrated with over 70 of Jerry’s evocative photographs, is an emotional response to the landscape and It gives an exciting dimension to the Lake District. Every image conveys the passion and excitement he feels for the area. The book captures the variety and glorious scenery in one of Britain’s favourite areas.